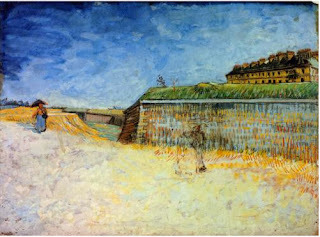 The Eykyn Maclean gallery, housed in a Georgian gem of a building next door to St George’s Church Hanover Square, shows 8 of the works of Van Gogh along with the works of his contemporaries within the same time frame – the 2 years Van Gogh spent in France from 1886 to 1888. Here is Wheat Field (1888), a subject he painted often, the lineaments of the ripened wheat fields and the reaped field sections outlined with a precision that not even Pissarro (Peasant Woman Picking Herbs, Cragny, 1886) could match. Pissarro admired Van Gogh greatly and was honest enough to tell him so. To a visiting Dutchman to 19th-century Paris who was yet to exhibit, Monet, Pissarro, Toulouse-Lautrec, Seurat and Emile Bernard were already celebrated, the painters of "le Grand Boulevard". No wonder these painters visited and took inspiration from him, and he from them. Van Gogh “draws” with paint. When he paints a tree or the contents of a vineyard he gives you essence of tree – the rocky terrain from which it sprang, the branches bent from the prevailing winds, the tortuous climb to seek the sun and the eventual fruiting. The result, from this artist who was so hard on himself, is like an architectural or even an engineering drawing. It is the kind of landscape you find in Hobbema, his 17th-century compatriot (see The Avenue at Middelharnis, 1689, at the National Gallery) , a painterly analysis of landscape that shows the elements that shape it: wind, rain, sand, silt, sun – and man. And the man, Van Gogh, knowing he neither created it nor tilled its fields, takes what I would describe as a reverent approach when he depicts it in paint. If you look at Fortifications of Paris with Houses, 1887 (above), lent by the Whitworth Gallery, Manchester, you can appreciate his understanding of mass, geometry, fluidity. You can see the sandbanks the river carved in the landscape, almost hear the water. It’s a study really, a beautiful study. He never got to start the painting he had in mind. Tickets are free but reservations are required for entrance.